Many classes do not require registration. No need to register. Just drop by and drop in on any of a large number of activities. Qi Gong, Yoga, Zumba, Volleyball, Tango and the list goes on. Some require a small per session fee but many are absolutely free. In addition, Open Gym hours provide hours of court time for pick-up basketball games or practice. Neighborhood advocate and long-time president of Upper Noe Neighbors Vicki Rosen passed away in June. She was a dedicated voice for the community and we are proud to honor her commitment and her spirit. A celebration of Vicki’s life and service to the community will be held Wednesday, October 14, from 7 to 9 pm in the Upper Noe Recreation Center auditorium. State Senator Mark Leno and District 8 Supervisor Scott Wiener will speak. A plaque in her honor will be unveiled in the vestibule of this community meeting room. The Upper Noe Neighbors Board of Directors invites all to come and share your company and your memories of Vicki. The event is free. Refreshments will be served. RSVP by Evite is appreciated, click here. The newly re-formed Friends of Fairmount Heights Association (FHA) is getting off to an active start. Just six months into formation, the group is throwing a party to celebrate Autumn and the joy of living. Says Events Chair Daniel Oppenheim, "The event is an opportunity to enjoy the company of your neighbors while sharing some food, drinks, conversation, live music and a great view. We do not have an agenda other than to have fun and connect with others in our local community." Neighbors will assemble on Saturday, October 10 at 10 a.m. for a potluck brunch atop Billy Goat Hill, the crown jewel of Fairmount Heights open space. Sweeping views overlooking San Francisco and the bay are enough reason to make the trek on a Saturday morning. Great food and inviting company will make it all that more worthwhile. View the event flyer. Many members of FHA have are connected with Friends of Billy Goat Hill Park and have been working together to influence Rec & Park progress on the Billy Goat Hill / Walter Haas Park trail project. The upcoming brunch provides an opportunity for others to see this path and talk about what is taking shape. The spooky woods of Stern Grove come alive with colorfully costumed children, ghosts and goblins on Friday, October 23 from 3 – 9 pm. 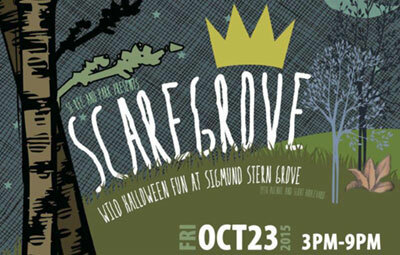 Scare Grove is a family-friendly event featuring carnival rides, a haunted house, costume parade, live entertainment, food for sale and more! Cost is $8 per person; children under 2 are free. View the event poster. Bring a dish to pass and perhaps a chair or blanket to sit on. "A Taste of 30th Street"
• Distribute our new Friends of NVRC postcard. This newsletter is distributed to nearly 1,000 “friends.” Make sure interested neighbors know about our group by helping distribute our informational postcard around the neighborhood. • Garden at the Park. Help keep the park beautiful by volunteering with the Ladybug Gardeners on the second Saturday of each quarter. The next date in 2015 will be August 8. All ages welcome, no experience necessary, community service hours credited. Even an hour would be a big help! Please email ladybugs (at) noevalleyreccenter.com.